The Pygmy community of Lotumbe, Democratic Republic of Congo want to learn sustainable beekeeping to form a social enterprise. As traditional hunter-gatherers, deforestation is affecting their food sources. By learning beekeeping and honey production, they can help to support themselves. The Pygmy community of Lotumbe in Congo's Equateur province live in the world's second largest rainforest. This is an area affected by deforestation that is impacting on the Pygmies. As traditional hunter-gatherers, their lifestyle centers on utilising the resources found in their environment, such as honey, wild mushrooms, and forest animals. For centuries Pygmies have harvested honey from wild bees. However, with increasing deforestation, the wild bee population is diminishing. 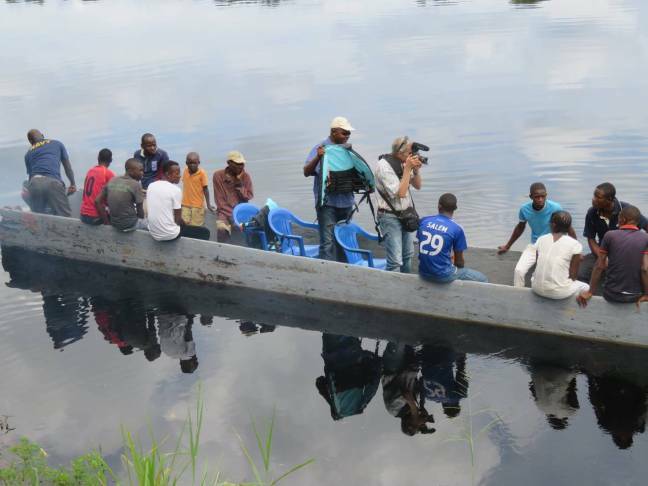 ABOVE: (Top row, L) Men in canoe are Congolese trainers from PLAAC, the nation’s beekeeping NGO, travelling to Lotumbe to introduce sustainable beekeeping concepts. (M) Prof Ken Kobre, centre with camera, captures the action as Bee Collective members travel by canoe to forest area on a quest to capture a Queen bee. (R) Trainees looking for Queen bee in a felled log. Before the training, honey was harvested after cutting down a tree. Now smokers help remove bees. (Middle row, L) Hand covered with bees - with no equipment the only option is to handle bees with bare hands. (M) Learning how to make a hive. (R) The trainers: Gerard (l), Toussaint (r) with community development advisor Safari. (Bottom row, L) Blaise and Jean-Bosco are Rotarians who have helped collect bee-friendly plants. (M) A Pygmy beekeeper next to his hive. (R) The Queen bee is carefully carried back to Lotumbe. Teaching sustainable methods of honey production and reforestation will help this population not only to provide nutritious honey to the fellow villagers, but also to maintain the second largest rainforest in the world. In addition, selling honey will be a source of income and a means of poverty alleviation for Pygmies in this part of the Congo. $10,000 is what is needed to help the Pygmy community launch sustainable beekeeping and explore ways of selling their honey to others. A donation of any amount helps! Help develop sustainable beekeeping in the Congo by donating money to train Congolese Pygmy beekeepers in a remote part of the Democratic Republic of Congo. establishing beekeeping as a sustainable community enterprise. Give the Lotumbe Pygmy a hand up, not a handout. Any donation will be gratefully received and used to help build a sustainable beekeeping industry, benefiting the entire community of Lotumbe. Australians receive tax deductibility. Please designate “bees” when making your donation. Thank you, or as we say in Congo, Merci mingi.